One interesting picture apparently taken from a booklet by Tupolev depicted an AWACS aircraft based on the Tu-214 that looks like the legendary TU-126. Another picture of such an aircraft is of uncertain provenance, but is evidently photoshopped. 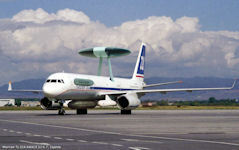 The Internet has long rumored that the AWACS aircraft was to be Tu-214 RA-64509 also known as the product 411. In reality, RA-64509 aircraft went to Transaero and proved the product 411 aircraft integrated electronic and optical reconnaissance Tu-214R with RA-64511. The primary way in which the Soviet Union remedied the short-comings of its ground-based radars was to deploy large radars on aircraft. These aircraft, which are known as Airborne Warning and Control Systems (AWACS), monitor enemy penetrators and coordinate air defenses over a large area. The range of an AWACS is much greater than that of ground-based radars - over 200 miles to the horizon and over 400 miles to another aircraft at high altitude. 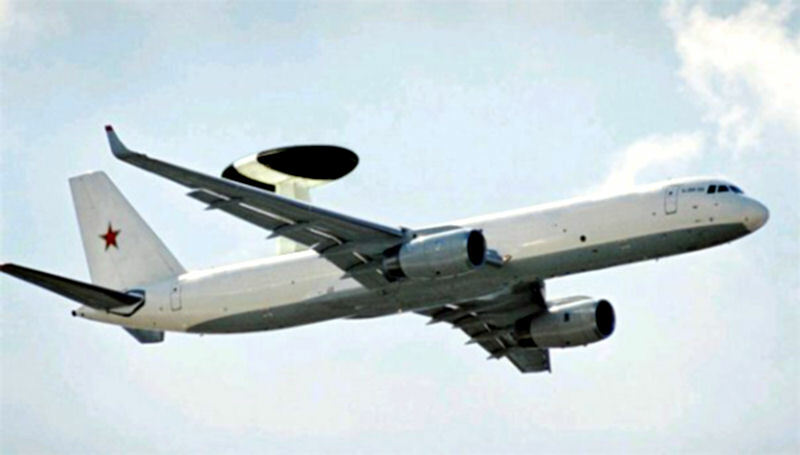 When airborne, the AWACS cannot be targeted in advance since its precise location is unknown. The first Soviet AWACS [aka SUAWACS], the Tu-126 Moss, was relatively ineffective in tracking low-flying bombers and cruise missiles. The more recent Soviet AWACS, the A-50 Mainstay based on the IL-76 airframe, was considered to be much more capable. Even so, the radio equipment on the Soviet radio location A-50 aircraft (Soviet AWACS), the counterpart of the US E-3 Sentry, was 50% heavier, mainly because of additional components for different control systems and military codes. The Mainstays patrolled near the Soviet/Warsaw Pact borders to track approaching U.S bombers, providing the greatest possible time to direct fighters to intercept them. Such patrols would force US bombers to start flying at low altitudes earlier than planned in their flight, perhaps at distances of 300-400 miles from Soviet territory. The bombers would have to do this to minimize the distance at which the AWACS can detect them, most likely decreasing the bombers' range (low-altitude flight is less fuel efficient than high-altitude flight). The A-50 entered flight testing in 1980; the new Soviet AWACS entered service four years later. The improved A-50M was developed several years after that. The Soviet Union deployed approximately a dozen Mainstay AWACS, and production was continuing when the Cold War ended. The type continued in service with the Russian Air Force, and the fleet was upgraded to A-50U standard. By 2012 it appered that the IL-76MD-90A would be used as the future Russian AWACS and aerial refuelling platform. The aircraft will be transferred to the G.M. Beriev Aviation R&D and Production Complex in Taganrog for fitting out and conversion to prototype of A-100, the future long-range radar detection and control aircraft(AWACS). The new A-100, equipped with powerful panoramic surveillance radars and state-of-the-art computers will be capable of scanning the airspace for hundreds of kilometers in every direction, identifying targets and sending complete targeting data to anti-aircraft and anti-missile defense systems enabling them to shoot down the targets, replacing the current A-50 AWACS based on IL-76 airframe.